Realising the knowledge assets of research for the rest of us – how about a set of recipe cards? This piece is about making academic and professional research as useful as possible to the intended beneficiaries – in this case people later in life and/or with disabilities, and those helping them – a well as professionals. It’s about doing that by involving beneficiaries in how knowledge from research is shared, as well as in the design of products and services. I’ve used the final event of the KT-EQUAL programme to spark some ideas … but there are outstanding questions in my mind, and the ideas are half-formed. So in the spirit of the piece I’m making this a draft and inviting amendments, additions and comments from the KT-EQUAL team and others. I hope I’m not too far off track, and that this contributes positively to “what next” for the programme if there are plans for a further stage. For the past four years a consortium of researchers on the KT-EQUAL programme have worked “to ensure that years of investment in high-quality research translate into real benefits that have an impact on people’s lives”. The focus has been extending quality of life for older and disabled people – which relates in part to the #dtlater work that I and others have been doing for Nominet Trust on digital technology later in life. This week provided an opportunity, through the end of programme celebration event in Whitehall, both to catch up on the highlights of the work, and reflect on where next with the body of knowledge that’s been gathered. 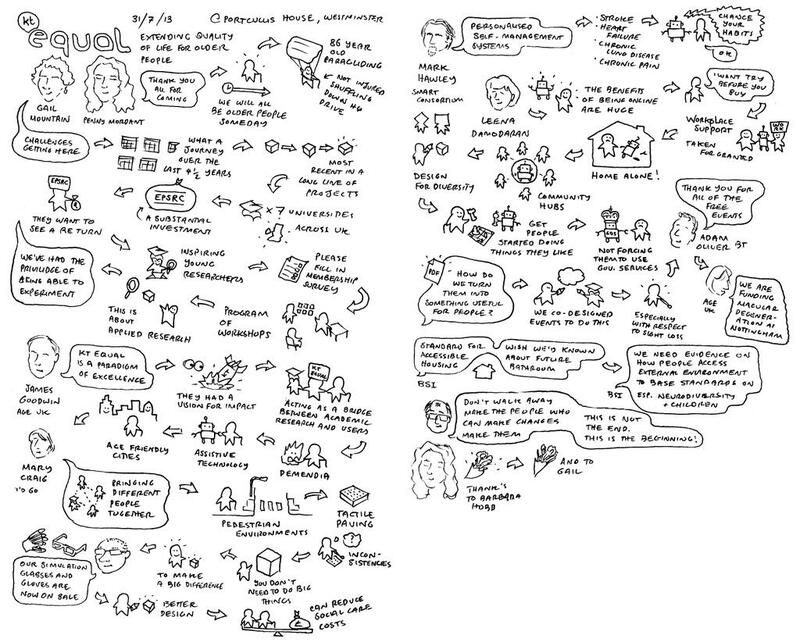 I love these sketch notes of the event from Ross Atkin. Visual knowledge exchange. Click for larger image. To transfer the knowledge out of funded research so that it reaches the intended beneficiaries. The aim of KT-EQUAL is to ensure that research findings reach industry, professionals, policy makers and older and disabled people. So it’s not about the original research, but about making that useful. The celebration was a fairly formal do in Portcullis House, but it included good opportunities for networking and a chance to chat with researchers. The SUS-IT team has developed proposals for a network of community hubs to support older people learning to use the Internet. PDF download here. The online content is in addition to the impact the programme has had during the past few years through collaborating with wide range of public and private service providers and product developers. As I understand it, that wouldn’t have been possible without KT-EQUAL: it funded exchanging knowledge, rather than the original progammes. There is so much potential for digital technology to enable people to make new connections, contribute to person-centred support, develop community networks and new models of care so an obvious question is what is stopping more widespread adoption? There is no shortage of innovations in digital technology and millions of pounds are being spent supporting further developments. It is less clear about the application, impact and usage of these innovations. One problem is the limited awareness in the sector and amongst the public about what is available and it’s value. I believe that a big deficit is the lack of a strategic approach to embedding digital technology in the range of options to support people to live more fulfilling lives. The KT-EQUAL programme has not been mainly about digital technology, but since the aim is exchanging knowledge it provides a chance to reflect on Shirley’s question, and the issue she (and I) have raised elsewhere – who is research knowledge for, and what will be done next to help people learn? Taking KT-EQUAL as an example, it looks as if the knowledge transfer to professionals in their objectives has been successful, but I’m less sure about how far “older and disabled people” can continue to benefit from, for example, the way publications are presented. There’s an email newsletter, but no continuing online community. However, see later for my ideas on recipe cards. I framed the challenge in a piece a wrote during our Nominet Trust exploration: We know lots about innovation, digital tech, social care and later life. Now who will make it useful? Although research programmes like KT-EQUAL may involved older people and those who support them in their studies and workshops, the content that they generate is usually designed for other professionals. It isn’t generally much use, for example, if you are a carer, friend or child of an ageing parent trying to figure out how to apply the lastest innovations. It may not necessarily be well-configured for civil servants and Ministers desperately looking for ways to support an ageing population with diminishing resources. That’s not to under-value, for example, the importance of knowledge exchange for companies developing new products, but we are entering a period when carers, care services and individuals will need all the help they can get in taking lessons directly from research work – and so will policy-makers. As one civil servant remarked at the event this week: this shouldn’t be the end of knowledge exchange – it should be a beginning. It looks as if the KT-EQUAL programme has provided great professional value during the past few years, but the key themes in this week’s event were “impact and legacy”. So – is there scope now for another phase of KT-EQUAL to re-purpose its kits and findings for wider audiences, showing the way for other programmes? And what might that involve? I got one idea from an interactive diagram on this page in the Inclusive Design Toolkit. 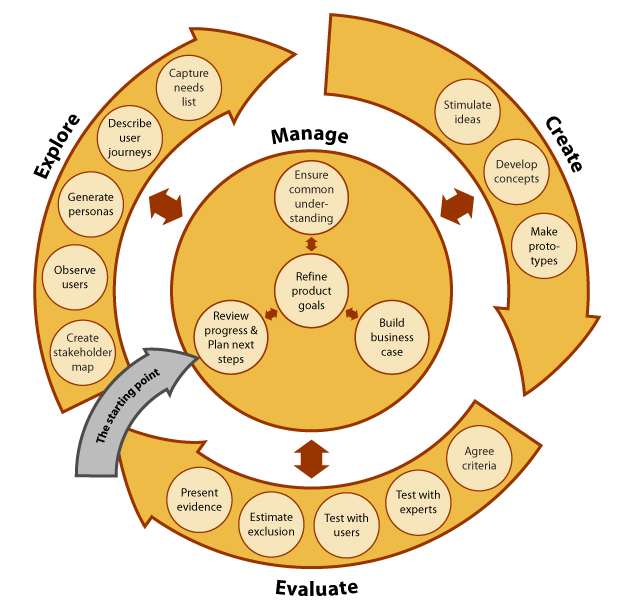 It summarises all the activities in creating, designing and testing a product, in association with a range of stakeholders including users. Suppose researchers now considered a wider range of stakeholders and users for their knowledge products … and applied this sort of methodology to developing some that would appeal, for example, to policy makers, older people, and those supporting them? The use of personas and user journeys has some similarity to processes I was discussing the other day with a team developing mobile phone apps. A quick search shows other reference to its use. To be more specific, suppose we took one sort of information product that’s familiar to everyone – recipe cards – and used that metaphor to explore what sort of decks of cards we might need to help people choose on their own, or in discussion, the sort of products, tools and technologies would suit their personal needs – or start conversations on policy options? Cuisine and cooking gives us a range of variables: personal preference, dietary needs, cost … coupled with availability of ingredients, skills needed, occasion etc. Through a mixture of pre-prepared dishes, home cooking, canteens and restaurants we manage to meet the challenge we identified in our work on digital technology in later life: everyone needs a different solution … but we also need to move to scale. I know cards work well because Drew Mackie and I have used them extensively in helping people choose social media methods, and we explored what’s involved here during our Nominet Trust work: How to organise ideas about digital tech in later life: invent some characters and tell their stories. On another front, the Transitions Towns network has turned their process of developing local projects into a set of cards detailing ingredients and tools, and I was fascinated to see How Google Unified Its Products With A Humble Index Card. I have no doubt that older people – let’s just say “people” – would be keenly interested in a process that involved them in co-design – as I reported here. It’s about doing things with people, rather than to them or even for them. That’s very much in line with the ethos of the team at the Helen Hamlyn Centre for Design, who created the Designing with People site. Anyway, this piece has turned into a bit of a ramble – or hopefully the start of a conversation. I hope the KT-EQUAL team will take my extension of their knowledge exchange ideas in good part, correct any misconceptions, and ideally join in a discussion about these or others ideas for extending the impact of their work. I wonder if it would be possible to run a workshop to explore extending the benefits of research through co-design of information products and advice with non-professionals. I expect someone has funded that idea already … but how to find out?